It seems as if the speed of life has increased so much that just keeping up can be a challenge. The unfortunate side effect of all this hustle and bustle? Forgotten appointments and tasks, even for the most responsible among us. Somewhere in Time: TouchTodo syncs tasks with due dates to Google Calendar, breaking down you to-dos into categories such as Today, Tomorrow, and Someday, among other options. That’s where TouchTodo comes in. This robust task manager from Chen’s Photography & Software has the ability to sync tasks with due dates to your Google Calendar. With the release of Google’s Push-Sync, those tasks can sync to your iPhone’s native calendar complete with alerts. This feature sets TouchTodo apart from many of the other task managing apps available and makes it hard to miss those appointments and deadlines. Starting TouchTodo will bring you to the main page where you will see an overview of your to-dos broken down into several categories like Today, Tomorrow, Someday, Overdue, and more. Next to each category, you’ll see the number of incomplete tasks in red and the number of completed ones in grey. Tapping one of these categories displays a list of all the tasks contained within, giving you the option to filter that list by Incomplete, Complete or Both. Tapping a to-do will pull up a page with all the details of that particular task, with the option of editing it. A Focus button in the upper left of the screen shows your tasks in order of priority so that you can focus on the most important ones first. Buttons along the bottom of the screen let you view projects, sync with Google Calendar, search to-dos, and access a FAQ/settings page. To create a new to-do, tap on the Add button at the upper right of the screen. You can enter information about your new task such as the name, location, priority, status, project, due date, and notes. As you type in information in the fields, the app will try to predict what you are typing. If the word “contact” shows up, tapping it brings up your contacts list; you can select a contact to be entered in the to-do. When entering a due date, you can choose all day or set a specific time; you also set the duration. Basically, you can make each to-do as simple or as detailed as you like. One nice feature is the badge number attached to the home screen icon letting you know how many incomplete tasks you have. TouchTodo also gives you the ability to create projects that can contain any number of individual tasks as well as a contacts list and notes. This feature is great for organizing and staying focused on large projects. Tapping on a contact within a project will allow you to either e-mail or call that person as well as bring up a map to their address. I found TouchToDo to be very deep, especially in light of the amount of detail I was able to attach to tasks. The app’s interface wasn’t as intuitive as I would have liked; in my opinion, it could use a little more polish. There is a slight learning curve to TouchTodo, and I found myself referring to the developer’s Web site for tips. After a while, though, using the app became pretty easy. TouchTodo’s sync feature worked well and it’s nice to get alerts for upcoming tasks and appointments. As task managing apps go, this one ranks high. At $2, TouchTodo is a great deal. 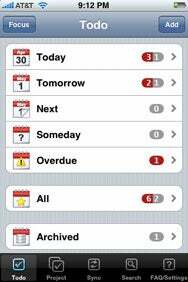 TouchTodo is compatible with any iPhone or iPod touch running the iPhone 2.2 software update.